This advanced acrylic based low viscosity formula bonds lace and poly based systems to the skin. Current rating 0.00. Total ratings 0. This advanced acrylic based low viscosity formula bonds lace and poly based systems to the skin. 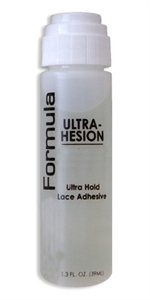 Ultrahesion has been proven safe for dermal irritation and has been proven safe for use on human skin. Ultrahesion is perfect for attaching lace fronts. This is a clear adhesive designed to re-tack many times. Cleans easily. Use 1 to 2 thin coats.